On the Maltese islands, the Commonwealth War Graves Commission maintains the graves or memorials for almost 6000 graves of Commonwealth service men and women from both World Wars, over 200 war graves of other nationalities and almost 4000 non-war graves. Some of the burials are in civilian cemeteries, but most of the war graves were made in the military cemeteries that were already in existence prior to WW1. There is also a Memorial for airmen who lost their lives in the Mediterranean area and have no known grave, and a memorial for the Maltese civilians who lost their lives in WW2. Some of the fallen defenders of Malta G.C. A photograph of the grave of some of the defenders of Malta G.C. Traditionally, Pieta Military Cemetery, Malta was the main garrison cemetery of the island and the Commonwealth War Graves Commission maintains it. Although most of those buried or commemorated here are casualties of WW1, there are some WW2 graves, including the one shown in the above photograph. The graves are organised differently to most of those maintained by the CWGC. Because of the shallow soil cover of much of the island, war graves on Malta had to be cut into rock. Hence, many collective and joint burials were carried out, eventually marked by flat tablets with several inscriptions on each. This particular grave is Collective Grave E.23. It contains the graves of six Artillery Men who lost their lives defending Malta G.C. in May 1942 - at the time of its greatest peril. Three of those buried in this particular grave are British (Royal Artillery) and three are Maltese (Royal Maltese Artillery). A photograph of 3598158 Gunner John Fitzsimons, R.A.
John Fitzsimons was one of the sons of William and Catherine Fitzsimons of Bransty, Whitehaven, Cumberland. On 15 June 1936 John Fitzsimons enlisted in the 5th Battalion The Border Regiment (the regiment's West Cumbrian Territorial Battalion). He was discharged by his own consent on 28 September 1936. A note in the Archives held at the Border Regiment & KORBR Museum, The Castle, Carlisle says that he later re-enlisted in the Special Reserve of the King's Own Royal Rifles. Afterwards John Fitzsimons transferred to the Royal Artillery, keeping the original service number he obtained when joining the Border Regiment (3598158). In 1942, Gunner John Fitzsimons was serving with No 5 Battery, 4 H.A.A Regiment (Anti Aircraft) and based in Malta during the siege by the Axis powers. He lost his life at the age of 23 on 25 May 1942, and was laid to rest in Collective Grave E.23 in Pieta Military Cemetery, 2 Km SW of Valetta along the Sliema road. He died for his loved ones far from Home". John Fitzsimons is also commemorated in two memorials in his hometown of Whitehaven. These are: the WW2 Borough of Whitehaven 'Book of Remembrance' and the WW2 Memorial at St Begh's R.C. Church, Whitehaven. During WW2 the Maltese islands, then a British Colony, were in a key strategic location. The Grand Harbour, Valetta was the only Allied-held harbour between Alexandria (Egypt) in the Eastern Mediterranean and Gibraltar close to the Western outlet of the Mediterranean Sea. In addition, Malta served as a base for the RAF and submarine operations to attack the Axis convoy routes to North Africa. In their turn, the Axis Forces laid siege to Malta blockading essential supplies of food, ammunition and fuel. The climax to the siege of Malta by the Axis Forces came in 1942, with 154 days of continuous air raids. More than 30000 buildings were destroyed and about 1500 civilians died despite most of the population being evacuated to the centre of the main island of Malta often sheltering in underground caves. In March and April 1942 more bombs fell on Malta than in the London during the 1940 Blitz. 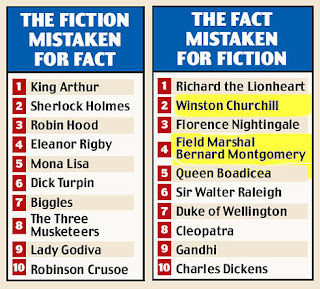 Based on a survey of 3,000 people, 1 in 4 Britons now think that Churchill and Monty are mythical characters, not real people like Sherlock Holmes. Ron has notified some of us of this, but I felt it important enough to post on the Blog. Please try to keep your language moderate in your Comments. This photograph shows an example of the type of tank used by the Germans during the Battle of Normandy (June - August 1944). It was taken at the Memorial Museum for the Battle of Normandy, Bayeux, Calvados, France. The Battle of Normandy Memorial Museum has a collection of some of the weaponry, equipment and uniforms used by the troops involved in the battle. It also has a chronological and thematic presentation of the events and stories in Normandy between June and August 1944. This photograph shows the type of American tank used in WW2. It was photographed outside the Memorial Museum for the Battle of Normandy, Bayeux, Calvados, France. The Batlle of Normandy Memorial Museum is situated at the 'official' limit between the "British" and "American" sectors during the Battle of Normandy. It is also close to the town centre and one of the largest British and Commonwealth War Graves Cemeteries in the area. This tank is part of the collection at the Memorial Museum for the Battle of Normandy at Bayeux, Calvados, France. The Germans nicknamed them 'Tommy Cookers', because of the tendency to burst into flames when hit by one of their shells. There was very little time for the 'Tommies' (the British soldiers inside the tanks) to escape. The photograph of the Fleet Aircraft Carrier HMS Illustrious is from the collection of the late Mr Stanley Armstrong of Whitehaven, Cumberland (now Cumbria). It has been copied with the permission of his family. She was built by Vickers Armstrong at Barrow-in-Furness, Lancashire (now part of Cumbria). Work began on 5 July 1937 and launched just before the outbreak of WW2 on 5 April 1939, shortly before this photograph was taken. HMS Illustrious was commissioned on 25 May 1940. For the first part of WW2, HMS Illustrious was mainly in the Mediterranean theatre, which included taking part in the Malta convoys and the Salerno landings of September 1943. In the latter part of the war, HMS Illustrious was assigned to the Eastern Fleet and Pacific Fleet. It was eventually sold for scrap in November 1956. Aircraft carriers were an important part of the fleet during WW2, providing aircraft that could provide air cover and airborne assaults on specific targets far from its home waters.